On September 28, 2018 the Supervisory Board of Deutsche Lufthansa AG approved the purchase of 27 short- and medium-haul aircraft. Purchase options for 24 Airbus A320neo and three A321neo will be converted into firm orders. With this decision, the Lufthansa Group is reacting to the positive market and earnings development and thus ensuring the necessary fleet size in the coming years. The total investment of this order amounts to a list price of about three billion US dollars. This increases the total number of A320neo and A321neo orders to 149 for the Group, 13 of them are already operating with Lufthansa. The A320neo and A321neo (short for “New Engine Option”) are scheduled for delivery in 2023 and 2024. Ten of the 27 new aircraft are intended for Swiss, the remaining aircraft will be in service by other flight operations within the Aviation Group. One part of the order will be equipped with Pratt & Whitney engines (PW1100G), the other with LEAP-1A engines from CFM International. This means that both engine types will continue to be available to the Lufthansa Group in roughly equal proportions for the “Neo” family. 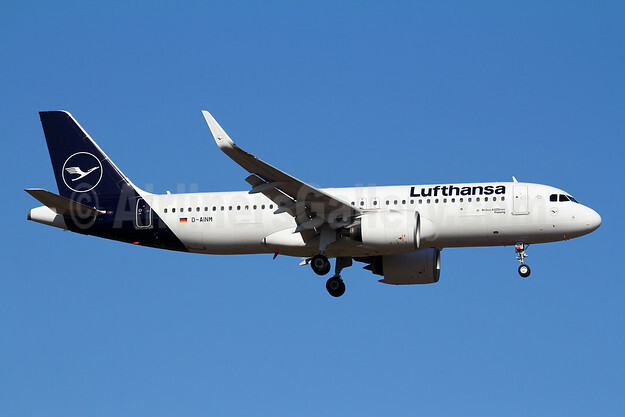 Top Copyright Photo: Lufthansa Airbus A320-271N WL D-AINM (msn 8456) FRA (Marcelo F. De Biasi). Image: 943646. This entry was posted in Lufthansa, Lufthansa Group, Swiss International Air Lines and tagged Airbus A320-271N WL, D-AINM, Lufthansa, msn 8456, Swiss International Air Lines on September 29, 2018 by Bruce Drum.